The Church of Scientology Block Parties offer music, dancing, faces painting, carnival activities and information on the Truth About Drugs, Human Rights and more. 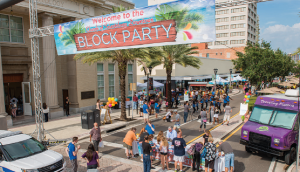 CLEARWATER, FLORIDA, USA, October 25, 2018 /EINPresswire.com/ — On Saturday November 17th the Church of Scientology invites the community to celebrate the centennial of the Clearwater Building with a Downtown Block Party. Family, friends and neighbors are welcome to celebrate with local non–profits along with the non-profits sponsored by the Church of Scientology. The event will take place on Cleveland Street between Fort Harrison Avenue and Garden Avenue. The event starts at 4pm and all are welcome. There is no cost to attend. Family friendly 1920s attire is encouraged. Guests also have the opportunity to learn more about the social betterment and humanitarian programs sponsored by the Church of Scientology. "There are so many activities that are available for everyone," said Nicole Biancolini, event organizer. "People can listen to music and dance. Kids can get their faces painted, participate in the carnival activities and can get information on the Truth About Drugs, United for Human Rights, the Way to Happiness and other programs. It shows youth there are solutions and things they can do to improve the situations that they may see in the world." The Historic Clearwater Building, situated on the corner of Cleveland Street and Fort Harrison, was the first bank of Clearwater built in 1918 and is now 100 years old. The Clearwater Building was originally built as a beautiful two-story brick structure, but when the Church of Scientology purchased the historic landmark in 1975 it had been “modernized” and covered with concrete slabs and dome-shaped awnings. six-month project to renovate the building, starting with removing concrete slabs from the 60s and 70s, revealing the original brick edifice beneath. In July 2015 it was officially reopened as the Scientology Information Center for anyone who is curious about the beliefs of the Church of Scientology, its practices and Scientology’s Founder, L. Ron Hubbard. Since its renovation and reopening, the Clearwater Building has been home to theatre groups, social groups and non-profits for the community. one-year anniversary of the opening of the Scientology Information Center on Cleveland Street and the Humanitarian Centers on North Fort Harrison. Since then, the event has become a quarterly celebration with the local community. For more information about this event or to participate as a non-profit please contact Amber at 727-467-6966 or amber@cos.flag.org.